A safety razor is a device used to remove hair from areas of the body where it is undesirable such as the face for men and the legs and underarm regions for women. The modern blade razor consists of a specially designed blade mounted in a metal or plastic shell that is attached to a handle. This kind of razor can be designed as a refillable cartridge which can accept new blades or as a disposable unit which is intended to be thrown away after the blade becomes dull. Since primitive times, shaving has been an important cultural grooming practice. Cave painting show that even the prehistoric men practiced shaving by scraping hair off with crude implements such as stones, flint, clam shells, and other sharpened natural objects. With the advent of the Bronze Age, humans developed the ability forge simple metals and began to make razors from iron, bronze, and even gold. The ancient Egyptians began the custom of shaving their beards and heads, which was eventually adopted by the Greeks and Romans around 330 B.C. This practice was advantageous for soldiers because it prevented enemies from grasping their hair in hand-to-hand combat. The unshaven, unkempt tribes they fought became known as barbarians, meaning the unbarbered. Until the nineteenth century, the most common razor was still a long handled open blade called a "cut-throat" razor which was difficult to use, required repeated sharpening, and was usually wielded by professional barbers. Credit for the first safety razor is generally given to a Frenchman, Jean-Jacques Perret, who modeled his design after a joiner's plane. He even wrote a book on the subject entitled Pogonotomy or the Art of Learning to Shave Oneself. As with the razors of today, Perret's design covered the blade on three sides to protect the user from nicks and cuts. However, it still required periodic sharpening to give a good shave. Similar inventions were introduced throughout the 1800s. Nonetheless, even as late as the early 1900s most men were still shaved periodically at the barber. Shaving practices began to change dramatically around the turn of the century. In 1895, an American named King Camp Gillette had the idea of marketing a disposable blade that didn't require sharpening. Gillette designed a razor that had a separate handle and clamp unit that allowed the user to easily replace the blade when it became dull. However, metal working technology took another two years before it was able to make the paper thin steel blades required by Gillette's design. Even though he filed patents in 1901, Gillette could not market his disposable blades until 1903 when he produced a total of 51 razors and 168 blades. By 1905, sales rose to 90,000 razors and 2.5 million blades. Sales continued to grow over the next several years, reaching 0.3 million razors and 14 million blades in 1908. After Gillette's initial success, other manufacturers soon followed suit with their own designs, and an entire industry was born. Over the last 90 years, a variety of products have been introduced including tiny safety razors for women, long-life stainless steel blades, twin-blade safety razors, the completely disposable, one-piece plastic razor introduced by Bic, and the state of the art Sensor and Mach 3 shaving systems by Gillette. Razor designs vary depending on the style. Some razors, such as the single piece disposables, are relatively simple. They consist of a hollow plastic handle, a blade, and a head assembly to keep the blade in place. They are primarily designed to be simple, economical, and disposable. The refillable cartridge style is more complicated. They are designed to give a more premium shaving experience with options like multiple blades, pivoting heads, and lubricating strips. For example, Gillette's Mach 3 razor, which was introduced in 1998, features a skin guard comprised of flexible microfins, a soft grip handle, water-activated moisturizers, a flow-through cartridge, optimal blade positioning, and other innovative features. The engineering behind some of these advancements is quite impressive. Gillette employs 500 design engineers, who are constantly developing new shaving systems. Preliminary designs are developed into working prototypes that are tested by over 300 company employees, who take part in Gillette's shave-at-work program. The company has 20 booths set up where employees use unmarked razors on different sides of their faces. They then rate performance attributes of each razor with the aid of a computer program. Engineers use this feedback to adjust their designs and create improved prototypes for further evaluation. Razor blades are periodically exposed to high levels of moisture and therefore must be made from a special corrosion resistant steel alloy. Furthermore, the grade of steel must be hard enough to allow the blade to hold its shape, yet malleable enough to allow it to be processed. The preferred type of steel is called carbide steel because it is made using a tungsten-carbon compound. One patented combination of elements used in stainless steel blade construction includes carbon (0.45-0.55%), silicon (0.4-1%); manganese (0.5-1.0%); chromium (12-14%) and molybdenum (1.0-1.6%); with the remainder being iron. The plastic portions of a safety razor include the handle and blade cartridge, or portions thereof, depending on the razor design. These parts are typically molded from a number of different plastic resins including polystyrene, polypropylene, and phenyleneoxide based resins as well as elastomeric compounds. These resins are taken in pellet form and are melted and molded into the razor components through a combination of extrusion and injection molding techniques. For example, in making the handle for their advanced shaving systems, Gillette uses a coextrusion process which simultaneously molds an elastomer molded over polypropylene to create a surface that is easy to grip. Razors may contain a variety of miscellaneous parts which help hold the blade in place, guards which cover the blade during shipping, or springs or other release mechanisms which facilitate changing of the blades. These pieces are molded by similar processes. The more sophisticated brands include a lubricating strip made of polyurethane, or other similar materials, that is impregnated with acrylic polymers. These strips are mounted on the head of the razor, in front of the blades. The polymer film absorbs water and becomes very slippery, thus creating a lubricating surface that helps the blade glide across the surface of the face without snagging or cutting the skin. 1 Blade manufacturing processes involve mixing and melting of the components in the steel. This mixture undergoes a process known as annealing, which makes the blades stronger. The steel is heated to temperatures of 1,967-2,048°F (1,075-1,120°C), then quenched in water to a temperature between -76- -112° F (-60- -80° C) to harden it. The next step is to temper the steel at a temperature of (482-752°F (250- 400°C). The plastic portions of a safety razor include the handle and blade cartridge. These parts are typically molded from a number of different plastic resins, including polystyrene, polypropylene, and phenylene-oxide based resins as well as elastomeric compounds. Razor blades are made from a special corrosion resistant blend of steel called carbide steel because it is made using a tungsten-carbon compound. razor blades which are almost 20 times wider and several times thicker. This design creates efficiencies in manufacturing by allowing the creation of a durable cutting surface using very little metal. Because the blade is so small, a special support structure is required to hold it inside the cartridge. 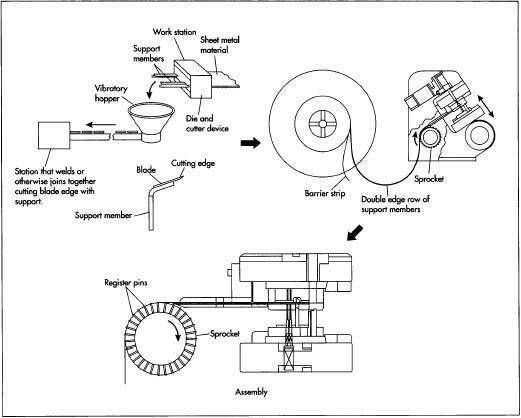 3 At a separate work station, another sheet of metal passes through a die and cutter device to form a series of L-shaped support members. These support members are formed in a line with two edge runners connected to each side. 4 The row of supports, still connected to the edge runners is rolled onto a coil and transported to the next station. There the support pieces are severed from the edge runners which are collected in a waste bin. The support members are dropped into a funnel-like device equipped with a vibrating unit which deposits individual support members onto a conveyor belt. The belt transfers the members in a single file fashion the third work station where they are welded onto the cutting blade. The finished blade assembly is then ready for mounting in the cartridge. Because the entire process is automated, waste from broken or bent cutting blades and support members is minimized. 5 Concurrent with the blade-making operations, the plastic components are molded and readied for assembly. The plastic resins are mixed with the plasticizers, colorants, antioxidants, stabilizers, and fillers. The powders are mixed together and melted in a special heated screw feeder. The resultant mixture is cut into pellets which can be used in subsequent molding operations. The manufacture of safety razors involves First making the blade cartridge by die stamping the carbide steel and then welding the blades to steel support members. Simultaneously, the plastic components are extruded or injection molded and readied for assembly. The blade cartridge and plastic ports are automatically assembled at workstations that use vacuum lines to orient and hold the small blade ports in place during transport and insertion. Spring loaded arms push the blades into place and secure them in the cartridge slots. 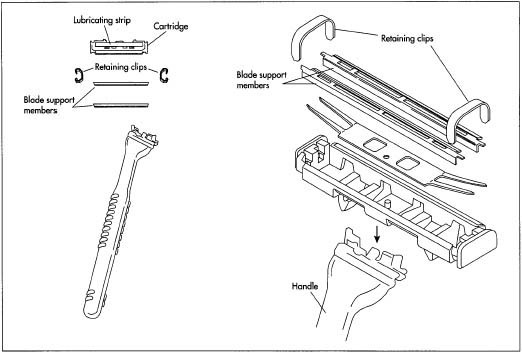 The finished cartridge may be attached to the razor handle during subsequent operations or they may be packaged separately. together, melted, and injected into a two piece mold under pressure. After the plastic has cooled, the mold is opened and the plastic parts are ejected. Major manufacturers have extremely efficient molding operations with cycle times for molded plastic parts routinely below 10 seconds. These processes are so efficient that the thermoplastic runners and other scrap from the molding process are reground, remelted, and reused. 7 The molded plastic components are fed to various work stations where the blade assembly is inserted into the cartridge. The work surfaces in these stations are equipped with vacuum lines to orient and hold the small blade parts in place during transport and insertion. Spring loaded arms push the blades into place and secure them in the cartridge slots. The finished cartridge may be attached to the razor handle during subsequent operations or they may be packaged separately. This step may include insertion of springs and other parts in the handle to allow ejection of the cartridge. 8 Razors are routinely packaged in clear plastic blister packs with a cardboard backing sheet that allow display of the razors design. Refill blade cartridges can be packaged in boxes, although most current designs require the cartridges to be held in a plastic tray that helps insert them into the handle. All finished razor components must conform to tight specifications before they are released. For example, blades must meet a designated hardness rating and contain a certain amount of steel. Gillette blades must meet a standard knows as Vickers hardness of at least 620 and a carbide density of 10-45 particles per 100 square microns to avoid rejection. The equipment itself operates so precisely that Gillette measures its reject rate in parts per million. Similarly, molded plastic parts are closely inspected by operators with lighted magnifying glasses to check for loose flashing or rough edges; they alert technicians when problems are discovered. In addition, razor components are checked by a computerized vision system which compares a critical dimension to a reference. Razor manufacturers like Gillette are constantly designing new and improved shaving systems. Their commitment to improved materials science continues to produce blades of increased hardness that are capable of sustaining sharp edge for more shaves. Advanced head design allows the blades to contact the face without cuts or nicks. They are also constantly updating their manufacturing equipment. The future manufacturing techniques also improve efficiency in molding and stamping operations. Gillette claims they are twice as fast as they were 10 years ago and have fewer defects. Panati, Charles. Extraordinary Origins of Everyday Things. New York: Perennial Library, 1987. Gillette Company. 1999. http://www.gillette.com/ (April 5,1999). How much capital do we need to start up disposable razor manufacturing.good quality but economical . PLEASE share project details of disposable razor & how much capital is required.i wanted to know the complete details of the project. Most of my life I used Gillette shavers. then I saw ads by Harry's. I purchased two shavers and several boxes of cartridges. The quality of the blades is impeccable but the plastic material holding them, foremost the two side hinges that give these blades some elasticity simply collapse backwards rendering the blades useless for shaving. I have a tendency of using blades for a very long time. With Gillette blades until the lubricating coating wears off, i.e. when they turn white, typically after about three months of daily use. harry's blades, although of equal excellence become useless after about ten to 20 shaves as the plastic hinges collapse. so I went back using my Gillette razors. When my last cartridge was used up I noticed the four boxes of Harry's cartridges i still had and began using them again. After 6 shaves in of the plastic hinges completely broke of. I checked their website and read all FAQ. Most of these questions appeared to me to be extremely stupid and assume therefore, they were made up by their marketing people. No question was included that refers to the kinds of defects I described above. Harry's is an aggressive advertiser, want the consumer to believe that the excellent blades are useable for most people for just 6-8 shaves, when in fact they would be good for most people for up to 6 months because they hope that consumers buy into their blade subscription program that suggests to replace blades a lot more often then actually needed. I grew up in Berlin not far from Gillettes factory there. Looks like I am going back to Gillette for good.